I didn’t plan this last weekend as an exercise in hiding from the masses that head for the outdoors on Holiday weekends, but it turned into just that. We started out leading a group of folks from a friends Coffee Shop on a little offroad romp. Since it was the first “Adventuremobile” meetup there were plenty of trucks, but none that had the time to go on our offroad excursion. Here is the adventuremobile meetup at Fourtillfour. A Porsche themed coffee shop in Old Town Scottsdale. Four Till Four = 3:56 which is sort of code for = Porsche 356. The owner, Nico, sold a 356 he had to fund the opening of the coffee shop, hence the name. Since there was just 2 trucks, plus a Touareg on 20" wheels, we decided to do a short side trip for the day next to town. For Nico, this spot was less than 20 minutes from his house in North Scottsdale. Not a bad get away to escape the city. We enjoyed a couple beers and some sandwiches. It was an easy day. The road to and from this oasis is barren and harsh. It was fun to be able to spot them up and down this nice little ledge. It was the hardest wheeling they’d done in their truck and with a nice hole the size of a truck to the left of Goose in this pic, it added a level of pucker to the exercise. K and I packed up the truck for the full 3 day weekend when we left that morning. We planned to catch up with or friends over on the Apache reservation, but right now that seemed like a LONG way away. We were wrong, very wrong. Most of the pull outs were empty and once we hit the summit we were all alone! I figure the only reason it was empty is that it was TOO close for a 3 day weekend. Everyone had the same idea to get further away since they had the time. Now that we were at about 5,200 feet I’d like to tell you that we relaxed and made a fire, but we didn’t. I passed out. After Expo and the cramming of work in before and after Expo I was beat. I wondered momentarily what I had done over the last 2 weeks and where it went, but my mind took over and I slept. I slept for almost 12 hours. I sure needed it. In the morning I walked around the area taking some pics. I felt nearly human again. An old miners shack? Hunting cabin? Whatever it was, it was floating on the surface without a real foundation so it wasn’t anything expected to be too permanent. The road ahead was covered in undisturbed pine cones. A sure sign that you’re on a seldom used road. I love it. Good morning vulture. I know it’s hard to tell, but I’m not dead yet. Big furry bumblebee’s were all over doing their morning harvesting. Even on the main road atop Four Peaks we were all alone. The sky was an overcast gray from a fire burning up near Young, AZ in the mountains. It’s hard to believe, but as the crow flies we’re less than 20 miles from Phoenix. So close and so far away. We headed down the backside of Four Peaks and around Roosevelt Lake. HERE is where they are, the masses. Hundreds of RV’s and trailers parked at the lakes edge. It was like a big noisy city in an otherwise quiet area. There was less room between most of them than between their houses back home. I love the water and boats, but this looked nothing like a place I wanted to be so we kept moving, too quickly, to Globe, AZ. As I was rolling into the outskirts of Globe I saw a Highway Patrol. No worries, I was in a 21 year old truck fully loaded down, right? Oops. The main clubhouse and check in area. There were buildings scattered around. All similarly nice at one time. The would be gas station and store. I’ll never understand it. Usually it’s kids, of which I was a stupid one too, but sometimes you see adults doing vandalism... I don’t get it. Just around the next corner you come to one of the more remarkable views available from a paved road in Arizona. 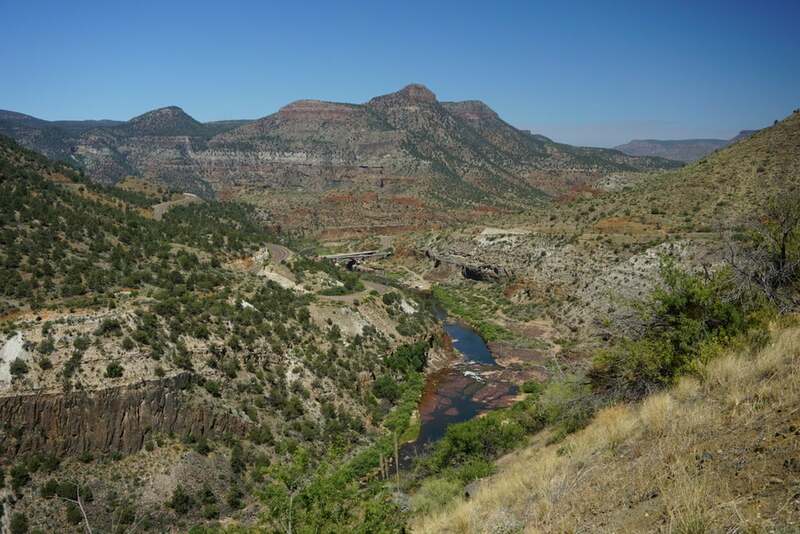 Salt River Canyon. On to the next stop, Fort Apache. 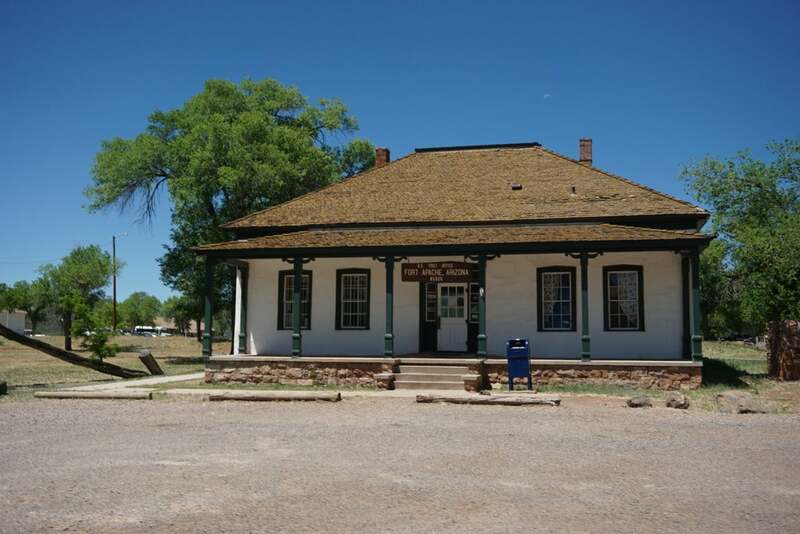 It’s hard to illustrate just how remote Fort Apache is, even today. It’s in the middle of nowhere. The three out of business gas stations you pass on your way there is further proof that this area is becoming more remote or staying constant at best. So, it’s surprising then, when you see a late 1800's city street in perfect repair. Then, we were back to dirt. Always bring an automatic gate opener. This area is fairly barren. Early settlers cut down almost all of the occasional tall pines to build homes or fences. What’s left are mostly Pinion Pines and a clay mud that will stop a Unimog if it’s wet. Eventually we found our friends and made camp. The life around here is all based around the rivers, creeks and lakes. On the plateau it’s hot and barren, but in the canyons the area comes alive. The rest of the group had been relaxing for a couple days. Catching dozens of fish and throwing them back. Not today though, today we wanted to catch enough for a big fish fry. I grabbed a couple beers, SPOT, my Leatherman, a full Camelback of water and went looking for my happy place. Can you find Goose in the pic above? The rest of the folks came back with a nice catch. 7 of the biggest bass they’d caught. We filleted them up (Easier and less bony than Trout) and had a helluva fish taco feast. Homemade Guacamole, Salsa, Pico De Gallo, black beans (Cook in a dutch oven). It was awesome. I love fish tacos even more than Carne Asada. It was a great night. I was exhausted still and barely starting to unwind from that feeling or perma-stress-work feeling, but it was sorely needed. Nooo! It’s Monday morning... Since we’d shown up to the party late, it was tough packing up and leaving the next morning. I DIDN’T WANT TO GO. Slowly, but surely, we made our way back to “civilization.” Funny how it sounds like a bad word when you’re coming from a place like this. “Civilization? You can have it. Give me the wild places!”- Me, just now, a second ago.